Buy The Best of Soul Cinema DVD Collection on DVD. 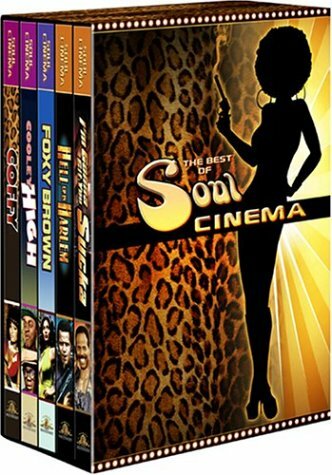 Just in time for Black History Month, MGM/UA Home Video has released a nifty new box set with five titles from their "The Best of Soul Cinema DVD Collection." And even if the five titles they chose don't particularly go together, they do present a broad cross-section of films representing the "Blaxploitation" genre. Fortunately, the first two titles are from the very top of the heap: Pam Grier's first two name-above-the-title solo outings, Coffy (1973) and Foxy Brown (1974), both directed by Jack Hill. Hill had worked with Grier twice before, in the Roger Corman-produced prison films The Big Doll House and The Big Bird Cage. In the grand tradition of those two similar hits, Hill re-drafted the same plot for both of his Grier films. In Coffy, Grier plays a nurse whose brother has overdosed. She goes undercover as an exotic prostitute (with an accent) to bring down the crime lord responsible for selling the drugs. While in Foxy Brown, she goes undercover as a call girl (no accent) to bring down the drug lords responsible for killing her new boyfriend. A bit more brutal than its predecessor, Foxy Brown benefits from the great Antonio Fargas (best known as "Huggy Bear" in TV's "Starsky and Hutch"). In the film's opening scene, Fargas attempts to duck an angry gangster at a hot dog stand. The scene should have done for tacos and coffee what The Godfather did for spaghetti. Both films have their selling points, including the beautiful Grier in all sorts of amazing outfits (and out of them as well). But their real power comes from Hill's potent pulp storytelling and direct style as well as the novelty of a female hero who takes charge and controls her own destiny. Both discs come with theatrical trailers and audio commentary tracks by Hill. Next we have Hell Up in Harlem (1973), which is actually the sequel to Black Caesar (not included here). Fred Williamson returns from a near-fatal wounding to kick some more behind. The plot has something to do with a ledger that names every hood in New York, but writer/director Larry Cohen basically patched the film together out of nothing and in a big hurry. Not only was Williamson unavailable for much of the filming necessitating the use of a double, but also Cohen was simultaneously shooting It's Alive! (1974). The result is a sloppy, scrappy film that doesn't make a lot of sense, but has a definite, palpable energy. Best of all, the legendary Cohen -- who wrote the screenplay for 2003's Phone Booth -- provides a new commentary track (recorded in 2001) that puts everything in perspective; it may be more entertaining than the film itself. The disc also includes a theatrical trailer and a teaser trailer. The strangest choice for the box, Cooley High (1975) is a kind of American Graffiti or Diner set in Chicago in the 1960s; the overall tone is serious, but the film contains stretches of humor, even if much of it is lowbrow or dated. Lots of vintage Motown music plays on the soundtrack. Screenwriter Eric Monte -- who also created the TV series "Good Times" -- based it loosely on his own experiences, while director Michael Shultz went on to make films like Car Wash and Krush Groove. The disc is presented in pan-and-scan only with no extras other than a "collectible booklet." Finally, we have Keenen Ivory Wayans' I'm Gonna Git You Sucka! (1988), a spoof of Blaxploitation that came at a weird time: most young viewers had never seen or even heard of blaxploitation movies and it was about six years before Quentin Tarantino would bring them back. Wayans' film wanders back and forth between deadpan Airplane-style humor and overt slapstick. Wayans plays a soldier who returns home to avenge his brother's death by going after the gangsters who supplied him with too many gold chains. I remember this film being hysterical at the time, but it hasn't aged well. Wayans' doesn't have much in the way of visual style or rhythmic timing, and his performance in the lead role is the weakest in the film. It does benefit from appearances by the aforementioned Fargas, a young Chris Rock, Isaac Hayes, Jim Brown and KRS-One with his group Boogie Down Productions.